I hope everyone had a good weekend! I have been looking to make some vegetarian meals to offset some of the more meat centered meals we usually have (and Kevin loves). I got a little bit of resistance that this recipe did not have any meat, but Kevin and I both thought the tacos were yummy and filling! It is good to have some meals that are more plant based in our diet, and you cannot go wrong with yummy veggie and bean tacos. Check out the recipe below! In a bowl toss together squash, 1 tablespoon olive oil, paprika and salt. Bake in preheated oven on aluminum foil lined baking sheet for 20-25 minutes or until soft. Heat pan over medium heat and add 1 tablespoon olive oil. Add red onions and chipotle peppers. Cook for a couple minutes and add the black beans. Add cumin and salt. Cook for a few minutes, mixing occasionally. In a blender or food processor combine avocado, lime juice and 1 tablespoon olive oil. Blend until smooth. Add salt to taste. Heat corn tortillas on skillet for 10-20 seconds per side. 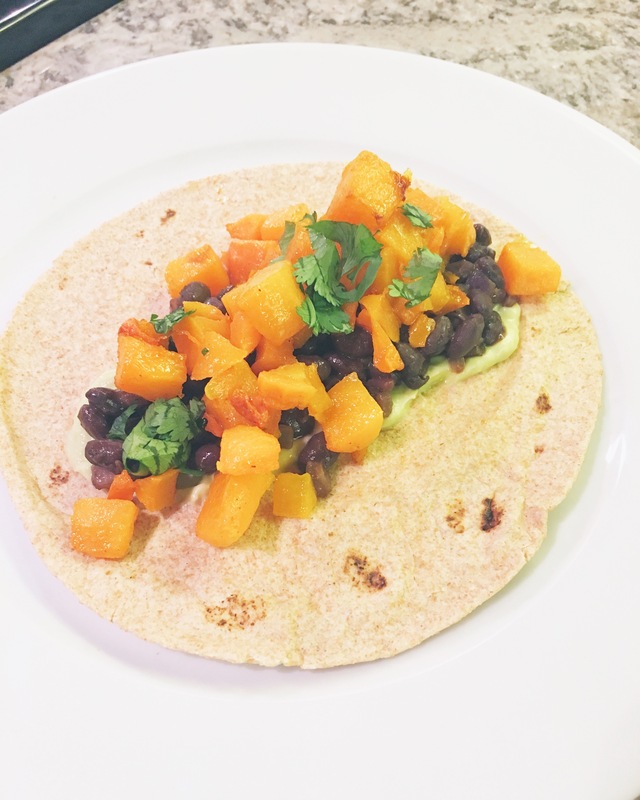 Top tortillas with squash, black beans, avocado crema, squeeze of lime juice and cilantro.